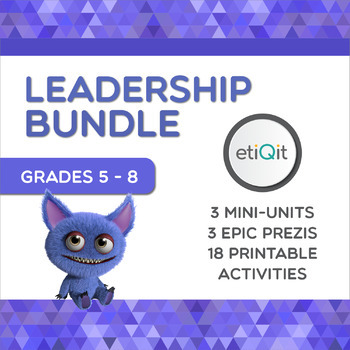 This bundle includes three mini-units (called Qits) designed to help students develop leadership skills and empower them to become successful youth leaders in their schools and communities. Students will explore specific strategies including: being a collaborative leader while working in a group (by delegating and leveraging talents of members); building relationships through assertive communication and active listening; joining, gaining experience in, and ultimately leading a club or organization; and working as a youth activist to influence elections and elect leaders who they believe in. To learn more about each Qit, click on the green Preview button above. Note: If you have purchased any of the above three Qits as individual products, please do not purchase this bundle, as doing so will cause you to receive a duplicate product. 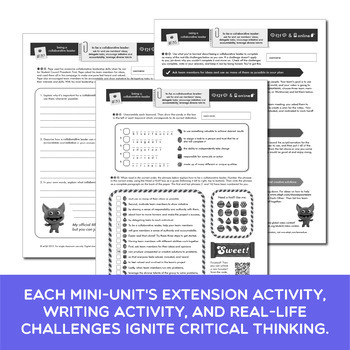 Instead, check out other etiQit Bundles and Qits. 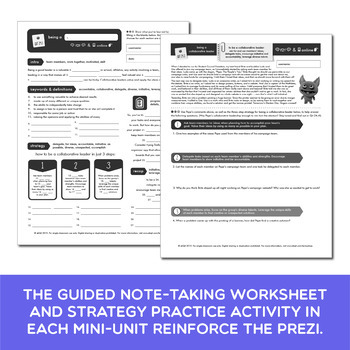 In total, you will receive 3 Prezis and 18 content-rich student printables in this bundle!